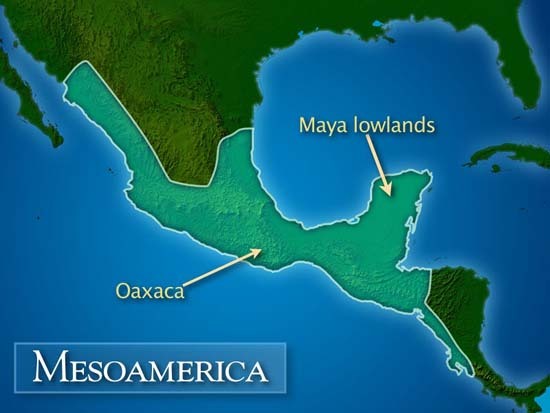 Mesoamerica has been the major geographic focus of my academic research. I’ve always enjoyed doing fieldwork in Oaxaca (my most frequent destination)—it’s easy to get to, relatively inexpensive, often gorgeous, and the archaeology is fantastic. You can’t beat the food, either! I find the archaeology of the highlands and lowlands both similar and very different. Indeed, you have to watch yourself that you don’t make too many assumptions about either similarities or differences. For example, ancient peoples made and abandoned many mounds in both places. A mound is a mound, right? It was the foundation for a temple, right? Maybe yes, but the scale, detail, and associated structures can vary quite a bit. 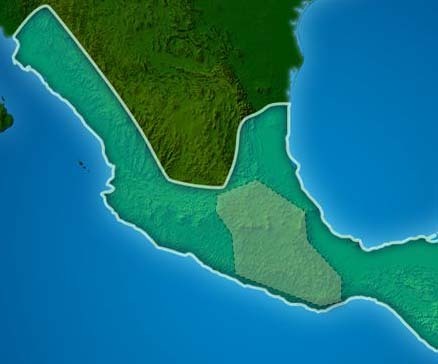 The northern and western boundaries of the central Mexican highlands are sometimes debated. Here I’ve included what is basically the prehispanic highland cultural area. Trading and communication contacts of course extended far beyond these bounds. The Mexican highlands are a geologically diverse region. One of the prominent features are the volcanoes and the volcanic landscape of the Trans-Mexican Volcanic Belt. Some of these are active today, and threaten the residences of many modern Mexicans. Perhaps the best known large archaeological site that was almost covered by lava is Cuicuilco, now within the sprawl of southwestern Mexico City. 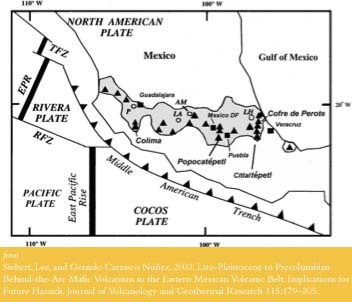 Sometime in the third century AD, the relatively small Xitle volcano erupted, its lava extending across parts of Cuicuilco and other communities. Cuicuilco immediately became a ghost town. In this vacuum, Teotihuacan, in the northeastern Basin of Mexico, at a comfortable distance from the long arm of Mother Nature, burgeoned. It joined Cholula, by the Early Classic period, as the economic and political powerhouses of central Highland Mexico. Meanwhile, in the southeastern highlands in the central Oaxaca Valley, the mountaintop site of Monte Albán held sway, although its political and economic character is generally interpreted as somewhat different. Monte Albán controlled a smaller area, and had a lower volume of distant trade, especially with the Maya lowlands, than the largest central Mexican cities. To read more about various places in the Mixteca Alta, click here. If you are interested in reading more about the archaeology of the Mixteca Alta, click here.